After long delays and missed deadlines, the OnePlus One has finally gotten a taste of Android 5.0.2 Lollipop, in the form of Cyanogen OS 12. When the ‘flagship killer’ arrived last year, it was praised for its specs and build quality, not to mention the extremely affordable price, but a lot of people jumped ship because they were promised Android updates within 90 days of Google’s release. It’s quite apparent that both OnePlus and Cyanogen have failed in this regard, but the update is nonetheless a welcome change from the aging Android 4.4.4 KitKat build. Rolling out as an OTA (Over-the-air) update since April 14th, the update should be available for all OnePlus One owners in 2-3 days. Another new addition is the email app, which is now replaced by the third party app Boxer. All Cyanogen OS 12 users will get the premium version of the app for free, which includes enhanced Exchange support, multiple accounts, customizable LED notifications and much more. There’s also the Baton app, one of the best Android app switchers, which lets you link apps to all your devices over the cloud. Now, as we mentioned earlier, the OTA update will roll out in phases, so you may not get it immediately. Also note that it requires the previous incremental update to CyanogenMod 11S, and is a full update, weighing in at almost 600 MB. If you can’t wait, however, and are comfortable with flashing your phone you can download the full flashable ROM from here. 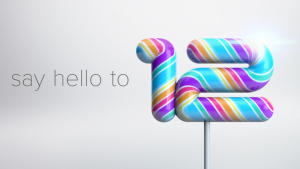 You will need to be on CyanogenMod 11S, fully updated to receive the update, and if you’ve flashed Oxygen OS, OnePlus’ homegrown version of Lollipop, you’ll need to flash the full ROM to get Cyanogen OS 12. Do let us know what you think of the new OS, and if you need any help!